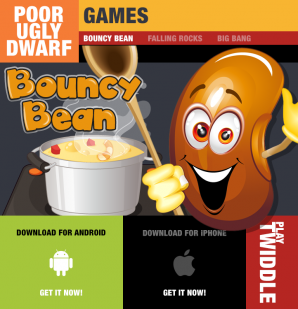 New indie game developer, Poor Ugly Dwarf, releases its first game: BouncyBean. Employing an innovative Tap-To-Own monetization plan, BouncyBean rewards players who touch ads by unlocking levels and eventually removing ads permanently. SAN FRANCISCO - April 16, 2014 - PRLog -- From the first bean drop to the final soup creation, BouncyBean delivers casual, yet addictive gameplay. A cross between Pachinko and Pinball, players drop a bean and watch as it bounces its way around “Sky-Kitchen,” collecting soup ingredients and bouncing off of fruit. Hit special beans to launch your bean in a new direction. Unlike most ad supported apps on the market this game offers more than the simple “pay to remove ads” option. BouncyBean lets you tap your way to a completely ad-free game! The Poor Ugly Dwarf implementation of Tap-To-Own allows players to touch an ad and play ad-free for thirty minutes. After 50 ads have been touched all ads are removed permanently. Inspired by the writing in the latest book by Jaron Lanier ( ‘Who Owns The Future’ ), the Poor Ugly Dwarf team fashioned their Tap-To-Own ad model in such a way that app costs do not have to be the sole burden of the player. With this model, a slice of every ad they touch is returned to the player and, once a given threshold is reached, their game is free. Free of ads, free of purchase, and free forever. : Monkey Byte Development, llc. Binx Steps Into the Data Game!